Yeah, we think you should make the switch. Let's come right out with it -- you should be running a dual-band 2.4 and 5GHz WiFi network. Why? Because the 2.4GHz spectrum is cluttered with everything from other networks to Bluetooth to cordless phones and microwaves, and all that RF interference slows everything down, making file transfers interminable and HD streaming nearly impossible. On the other hand, 5GHz 802.11n is clean and incredibly fast -- we're talking almost hardwire fast. But you can't just move up to 5GHz without leaving your phones and other legacy devices behind, so you've got to keep 2.4 around as well -- which is really easy if you've got a simultaneous dual-band router like Apple's new Airport Extreme or something like the D-Link DIR-825, and only slightly harder if you don't. And, as luck would have it, Apple just sent us a new AEBS to play with, so we thought we'd show you how to configure both kinds of setups. We promise you'll thank us. If this looks familiar, it's time to go 5GHz. Okay, so first things first: you need to make sure your laptops and other devices support 5GHz 802.11n. If you've got a Mac with a Core 2 Duo, you're all set. PC users will need to check their gear -- you should be fine if you have a recent-vintage 802.11n WiFi chipset, but if not, you'll have to pony up for a USB or PC Card adapter, which is ugly but worth it. Next, you're going to need to decide if you want to run a two-router setup or consolidate to a single box. If you've got a newer 5GHz-capable router already installed and you like it, we'd say your best bet is to just add a cheap second unit -- configuration isn't that hard, and you'll actually end up with a more flexible rig. On the other hand, if you've got an older router or you want the simplest possible networking setup, an upgrade to one of the new dual-bands on the market might be in order, since the experience is seamless -- Apple's AEBS will even auto-select the fastest connection for you. That said, after having run both setups, we've settled on having two routers -- it's a little messier, but the sysadmin in us secretly likes having redundant hardware in the house in case something goes awry. What can we say? We're nerds. If running two routers is too messy for you or you don't already have a 5GHz-capable router, a single dual-band router is the way to go -- the Airport Extreme we're going to use here is $179, but you can find other brands on sale for $100 or so. Plus, setup is dead simple -- ready? It's a little less seamless, but you'll be able to manually set all your 5GHz-capable devices to use the faster network. Setup with any other dual-band router is more or less the same -- just make sure you've got both radios going. But what if you've already got a 5GHz-capable router that works well? It's not going to be as easy as the single-box setup, but it's not exactly hard, either -- you just need to flip the right switches and plug in a good cheap router to serve as your 2.4GHz access point. We use a $30 Belkin, but you've got tons of options here -- you don't need any extra bells or whistles, just reliable operation. Configure your main router as you normally would, giving it a unique SSID and selecting 5GHz-only operation where appropriate. Generally this'll be under a wireless settings menu, but different manufacturers put it in different places. Next, make sure you're set up to use "wide channels." This bundles two 802.11n channels together, and it's a big reason for the speed boost. Again, this can be hidden -- on an Airport you have to click the "Wireless Options" button. And that's it -- you can begin enjoying 5GHz immediately. You'll notice that file transfers are much faster, HD video streaming is now a realistic possibility, and wonder of wonders, you've become much more attractive overnight. But what about your cellphones and older devices? Let's get that 2.4GHz access point set up and bring them back online. The IP address here should be in the NAT range as the one used by your main router, so make sure you don't put in a 10.0 address if you're runnning a 192.168 network or vice versa. (Check your other network to make sure.) Other than that, all you really have to do is pick an unique SSID that's different from your 5GHz network and set a password, and you're all set. 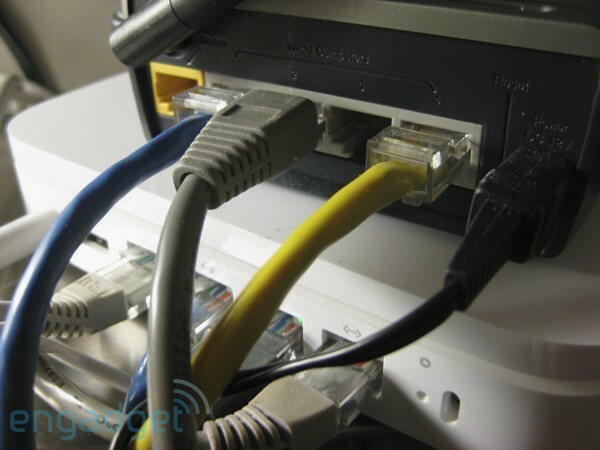 Connect a short Ethernet cable between the LAN (not WAN!) ports of both routers, and enjoy -- you've got the best of both worlds. Whichever way you choose to go, we're pretty sure you'll be happier running at 5GHz -- it makes wireless networking seem like a viable alternative to Ethernet, which is not something we ever thought we'd say. And besides, you needed a weekend project, right?